The King’s Daughters, Camp Good Will, and the Mary Club were three charity organizations formed around the turn of the century and based, either partly or fully, in Evanston. Each of these charities were either run or greatly staffed by women, and they were created in order to help poor and needy families and young girls. Those who received charity were given free food and a place to stay for varying degrees of time, and all of these charities were centered around helping Chicagoans in need. For the Evanstonians involved in them, much value was placed in giving the poor city-dwellers a chance to live in and enjoy the suburban life, yet the community had a vastly different relationship and interactions with each due to the structure and purpose that the three charities served. The King’s Daughters was an early Evanston women’s philanthropic organization, and it was formed in 1893. It began as an opportunity for women to sew clothes that they would then donate to other charities, but soon the King’s Daughters, “fed by an ambition to provide a service which was most needed and which they were best equipped to supply,” (Evanston Review, 11/7/1935), decided to open a home at 2329 Hartzell Street. At first, this Home was used as a place to house people with cardiac issues, and then as a house for women enrolled in Northwestern’s graduate school. The King’s Daughters, however, wishing to do more, consulted Judge Mary Bartelme for advice, who suggested that they create a home for dependent girls. The Home was a place for a dozen girls between 11 and 18 to live, relax, and grow into young women. Though all of the girls came from broken homes and families, the King’s Daughters emphasized that these girls were certainly not delinquents: they were simply good girls who came from bad environments. Mary Bartelme, the woman who the King’s Daughters had consulted, was appointed assistant to the Judge of the Cook County Juvenile Court in 1913. She then quickly noticed that many of the girls who appeared in court were in a troubling situation: the court would either have to send them back to their homes, which were often not good environments for a young girl to be in, or they would have to be sent on to prison, often just for committing a very minor crime. In 1914, she created the first Mary Club out of her home in Chicago’s Austin neighborhood as a place for these girls to live. 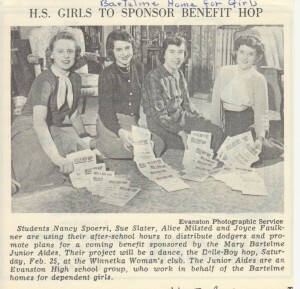 Though these girls were delinquents, Mary thought that their home life and environment were not conducive to helping them develop, and that the Mary Club would change that. The girls spent between a few weeks and a few years in the Club, until they were 16 years old. In 1918, she created a second Mary Club at 1102 Elmwood Avenue in Evanston. Thousands of girls passed through her homes and were given a safe and free place in which they could live and grow. Between the opening of the Hartzell Home and the formation of the Evanston Mary Club, Camp Good Will was created and thrived for 17 years. Based on of a similar camp in Oak Park, it opened in 1900 as a place to provide poor and needy Chicagoans, mostly mothers and their children, a summer respite on the lakefront. The program eventually ran for eight weeks in total, with 1200 women and children coming to Camp Good Will every year. The churches of Evanston traded off running the camp, and the women from the churches made sure that their guests were well fed, healthy, and enjoying their stay. 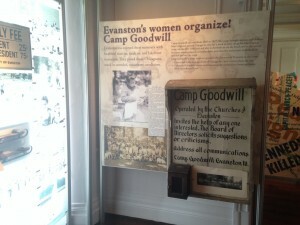 Though the King’s Daughters, the Mary Club, and Camp Good Will were not the first charities or philanthropic organizations to have been created in Evanston, they were unique in their settlement-like model. Earlier charitable organizations were more focused on teaching girls vital skills, or raising money to help the needy, yet were not involved with creating social, live-in spaces right in the heart of the community. The King’s Daughters’ Hartzell Home was full of girls who, despite being poor, were repeatedly emphasized as being non-delinquent. When the home closed down, neighbors were sad to see these nice girls go. Mary Club, on the other hand, was full of girls who explicitly had gone through the court system, and therefore would have likely been less welcomed by the Evanston community. In order to keep both the Hartzell Home and the Evanston Mary Club in service, both charities hosted many events in order to raise money. These events, ranging from balls to lectures to a county fair, gave Evanstonians an opportunity to support charity work without ever having to come into contact with those who received the charity. In each of these three charities, needy Chicagoans traveled a dozen miles north to live in the peaceful suburb of Evanston. They all received free food, a place to stay, and the ability to participate in Evanston recreational activities. Everyone could experience the calmness not found in their former city homes for anywhere between a week and a few years. But just as much as these charities were for Chicagoans, they too were for the people of Evanston. Whether Evanstonians were donating money, goods, or their time, at the turn of century, community and charity in Evanston were intimately intertwined. For more on these three women’s charitable organizations or the many others that existed over Evanston’s history, visit our research database.